Local Bay Area radio station KQED profiles one of San Francisco's top mixologists. Alberta Straub mixes fresh ingredients in innovative ways at San Francisco's Orbit Room. She reminds us all that just because a drink comes in a cocktail glass, doesn't mean it's a Martini. Real Audio stream at KQED. Kim is in charge when it comes time to put up a the tree at the restaurant. When you're putting up and decorating a 14 to 18 foot tree, you need some liquid inspiration. This year Kim wanted Hot Buttered Rum. Pre-warm your favorite tiki skull Santa mug with hot water. Put one barspoon of the batter in the mug and add 2 oz. of a nice aged rum and a dash of falernum. Add 1.5 oz boiling water. Stir it up and garnish with a cinnamon stick. I used Gran Centenario 23-year old rum and Fee Brothers Falernum, but you can use whatever you have on-hand. Same with the spices. This is a recipe you can really customize and make your own. Don't forget to head over to The Spirit World to see all the festivities. Now get that tree up! Happy Holidays. Keep an eye out next week for this special Repeal Day New York Times. 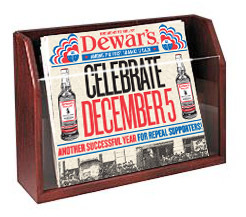 Dewar's is wrapping the Times in a special section promoting Repeal Day (and Dewar's Whisky) on Tuesday. Rumor has it there will be period-costumed newsboys running around and selling the Times on the streets of Manhattan. Keep up with all the Repeal Day action over at Jeffrey Morgenthaler's. 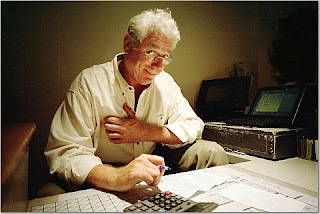 Jimmy's Cocktail Hour is part of the Cocktails & Spirits Ad Network. To advertise on this site or across a network of cocktail and liquor related weblogs, click here. Mixology Summit 2009: Enter Now! Am I (Bar) Smart Yet?